I suppose I will read this book. If it's on the bestseller list. I was interested in the waspy comments! Mating Rituals of the North American WASP ! You really do not hear that term too often any more. Welcome to Win A Book. Just posted this on there. What a creative title. Hilarious. Lol, I originally thought this book was about bugs too! But now I know better and I think I'd enjoy it very much! Slightly sarcastic tone - "definitely" will do (when you don't intend to). Tonight, while we worked on trimming my Bismark palm, we had a lot of angry wasps dive-bombing us. Oh. Wait. That's a different kind of "wasp", isn't it. Sorry. I'm not really a WASP, so I don't know how to say "WASP-y" things! Please don't hold that against me, and maybe count me in your giveaway anyway? Please? Sounds like a great book. Not at all what I expected from the title. This sounds like such a delightful book. What a fun diversion for a beautiful, sunny day. I highly anticipate reading it. I'm afraid I don't know many WASP-y comments or vocabulary since I would qualify as a WASP at all. I know more about the flying kind since they are always trying to dive bomb me :-) But the book looks like a great read so please include me. I think people get the mistaken idea that everyone in Connecticut is a WASP, which is certainly not true! I follow you on my Google Reader! Thanks for the giveaway! This book sounds like a really fun read. I love the title! I can see it as a movie someday. Oh, you simply must enter me, as this book sounds just the thing to read outside my summer home while acquiring a golden glow. oops, sorry, forgot to leave my email. I'm another one who first thought the book was about the kind of wasp that flies around and makes nests where you don't want them like in your grill or mailbox! I'm not a wasp so I don't know how to leave a waspy sounding comment. I would still like to read the book. Thank you for the giveaway! Did you know WASP stands for White Anglo Saxon Protestant? I thought that was interesting. Not sure what a Waspy comment would be though! Hope you will enter me in the giveaway anyway! Thanks for the giveaway! This one sounds great and I love the cover. No need to enter me. This will appear on my next Giveaways Galore, this weekend. Sounds like fun chick lit that is hopefully a little deeper than your average gold-digger story. Would you care to join me on my yacht or perhaps a nice afternoon of croquet on the lawn in front of the estate? My thoughts automatically went to flying bugs. But after reading more about the book, it seems very interesting. Plus, I love any books that can be described as a romantic fairy tale! A WASP comment. Think I read somewhere that saying something like "Is she In?" meaning is she one of us?? Does she fit into our way of doing things and dressing etc. A little late but I twittered this giveaway. Not sure if I can come up with a WASPY comment, but I sure do want to read this book! Thanks for the chance to win a copy! I don't think I'm very good with waspy comments, but maybe if I read this book I'll be able to come up with some! Please enter me! This one looks good for the beach. You don't ask me to read this book, I'll inform you when I'm ready to read it. Thank you very much. Reading is so boring might mess up my manicure, but send the book anyway and I will have Bostwick read it to me while he serves breakfast each morning. This book is right up my alley! count me in! A waspy comment-I'm allergic to them actually-but did manage to anger the nest once. I cannot think of the other type of wasp comment. This book sounds like a really fun summer read. I would really enjoy reading it. Please enter me. Thanks! I'm not sure what a WASPy sounding comment would be! But I do know that this is one book that I definitely want to read. The situation seems so funny to me & I think I'll get a lot of laughs out of this one. lol, this has me cracking up. I never learned that wasp meant white anglo-saxon protestant. But, it makes sense. You learn something new every day I guess. Please enter me. This really does sound like a great book. Thanks! This sounds like a great summer read, full of romance, and exploring possibilities. 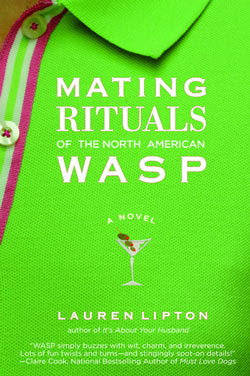 I originally thought this book was actually about WASPS (yes, I'm that dumb LOL) so wasn't very interested. But your review makes it sound great. Thanks so much!! This book sounds like a good one. Please include me in your giveaway. i love to sip champane in my pearls!! ahha hope that sounds waspy!! oh wow what a great book giveaway!! please enter me!!! wow what a great sounding book! please enter me!!! Sounds like a fun summer read! This sounds like a great book to read at the beach. Enter me please! I would love love love a copy of this!